Canadian Black Book said it uncovered more “very telling statistics” as part of its annual vehicle-buying study conducted by Ipsos. The latest endeavor breaks down the differences between various Canadian demographics in how they shop, what they expect and overall knowledge gaps when it comes to vehicle shopping, buying and ownership. A primary example of its findings, Canadian Black Book discovered vehicle ownership (or leasing) demonstrated a wide gap as 48% of survey participants 18 to 34 years old own or lease, while 77% of participants age 55 and older do. Nationally across all demographics, the survey suggested that 47% of the vehicle owning population is ready to buy a new vehicle in the next 24 months, which is down 4 points from last year. The survey showed the group most likely to buy in that timeframe are individuals age 35 to 54 at 53%, with potential buyers ages 18 to 34 right behind at 51%. The oldest group is much less likely at 37%, according to the survey. Canadian Black Book noted a partial explanation to the ownership and leasing trends as well as intentions to buy by age group is reflected in the growing trend to rely on ride-sharing. Study results showed 12% of respondents said they rely on this evolving service. The results also determined more than double that number (27%) are in the youngest age category, compared to 9% of individuals age 35 to 54 and only 4% in the 55-plus age range. When it comes to the idea of purchasing vehicles fully online without going into a dealership, Canadian Black Book discovered nearly three in 10 respondents (29%) suggested they would likely do so. The level represented a 2-point lift from a year earlier. The study found that men are more likely to choose this route at 36% while women registered in at 24%. It’s even more likely potential buyers would go the complete online route if they have children (40%) versus households without children (24%). Perhaps not surprising, Canadian Black Book pointed out the most probable demographic to conduct end-to-end online vehicle purchases are the youngest (ages 18 to 34) at 43%. The older demographic at 55 and older is least likely at 16% with the middle age bracket at 35 to 54 coming in between at 30%. 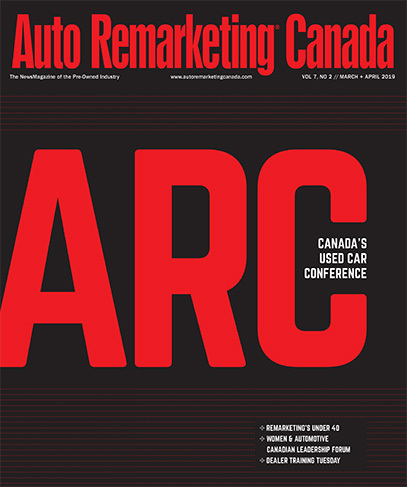 “As we dissect this research, we are finding some very telling statistics that we monitor from year to year, which help us understand developing trends and allow us to offer this information to the auto industry in Canada,” Canadian Black Book president Brad Rome said. The survey continued with respondents being asked, “How likely are you to reduce the number of vehicles in your household over the next two years?” Findings showed two in 10 Canadians said they would be likely to do so. When asked the same question, Canadian Black Book reported 35% of the younger generation responded that it would be likely. While 19% in the middle age group said it was likely, only 12% of the oldest participants said it was likely. As for other online car shopping tools, specifically trade-in value calculators, surprisingly older Canadians are more likely to use these tools to research values with 65% of those 55 and older choosing this option, compared to 55% of the 18-34 age group. At trade-in time, the survey found only 21% of younger vehicle buyers had a good idea of the value of their vehicle, while 40% of those participants 55 and older suggested they had good knowledge of what their trade-in was worth. Sufficed to say, Canadian Black Book stressed the older generation are far more likely to have traded-in a vehicle at 63% of those respondents, compared to only 29% of those participants from the youngest group. “This directly correlates to experience in the market and why the industry needs to treat these consumers differently, in how they market, sell and service them along the ownership journey,” said Brian Murphy, vice president of research and editorial at Canadian Black Book. Canadian Black Book went on to mention gender and age also bear some major discrepancies as it relates to the acceptance of alternate energy vehicles. If fuel prices were to increase $0.25, the survey indicated men are more likely to consider an alternate energy vehicle at 58%, while only 38% of women would be likely to choose the greener option. The results also noted the younger a vehicle owner is, the more likely they would consider these vehicles as 58% of participants age 18 to 34 said they would, much higher than the 35-54 age bracket (48%) and 55 and older segment (40%). When it comes to financing, Canadian Black Book saw a similar storyline where younger vehicle owners are more likely to hold a loan with the 35-54 age bracket coming in highest at 37%. The oldest bracket registered at just 23%. From a gender perspective, 34% of men hold auto loans compared to 28% of women. As expected, Canadian Black Book learned that income range and level of education directly influences the purchase decision of whether to buy new or used. The survey showed 65% of participants with university educations and the same number of individuals in a household making more than $100,00 per year buy new vehicles. Conversely, only 36% of those surveyed in households making less than $40,000 annually intend to buy new. In terms of gender, six in 10 men are likely to buy new versus 52% of women. “Many of these trends might be what you would expect to see, however, seeing the actual numbers could serve as an eye opener and help determine strategies for OEMs and dealers moving forward,” Murphy said. Ipsos conducted between the poll on December 21-24 on behalf of Canadian Black Book. For this survey, a sample of 1,250 Canadians aged 18 and older was interviewed.